China detained a total of 20 people following the publication of a letter calling on President Xi Jinping to resign, the BBC has learned. The letter was posted earlier in March on state-backed website Wujie News. Although quickly deleted by the authorities, a cached version can still be found online. One of those held, columnist Jia Jia, appears to have been released, but most of the others are still believed to be in detention. In most countries, the contents of the letter would be run-of-the-mill political polemic. "Dear Comrade Xi Jinping, we are loyal Communist Party members," it begins, and then cuts to the chase. "We write this letter asking you to resign from all party and state leadership positions." But in China, of course, and in particular on a website with official links, this kind of thing is unheard of and there have already been signs of a stern response by the authorities. The detention of Mr Jia was widely reported to be in connection with the letter. Friends say he simply called the editor of Wujie to enquire about it after seeing it online. However, his lawyer said Mr Jia was taken away by Beijing police on 15 March, when he was due to board a flight to Hong Kong. There was no news from Mr Jia until 25 March, when he wrote on social media that he had been released, and thanked his supporters. However, the BBC has spoken to a staff member at Wujie who has asked to remain anonymous and who has told us that in addition to Jia Jia, another 16 people had been "taken away". The source said they included six colleagues who work directly for the website, among them a senior manager and a senior editor, and another 10 people who work for a related technology company. And a well-known Chinese dissident living in the US said three members of his family, living in China's Guangdong province, had also been detained in connection with the letter. Wen Yunchao said he believed his parents and his brother had been detained because authorities were trying to pressure him to reveal information. But he told the BBC that he knew nothing about the letter. The letter focuses its anger on what it says is President Xi's "gathering of all power" in his own hands, and it accuses him of major economic and diplomatic miscalculations, as well as "stunning the country" by placing further restrictions on freedom of speech. The latter is a reference to Mr Xi's high-profile visit last month to state-run TV and newspaper offices, where he told journalists that their primary duty was to obey the Communist Party. The letter first appeared on an overseas-based Chinese language website, well outside the realm of Communist Party censors, but the big question is how it then made its way onto Wujie. The idea that any Chinese editor of sane mind would knowingly publish such a document seems so unlikely that there has been speculation amongst some Chinese journalists, in private, that Wujie was either hacked, or had perhaps been using some kind of automatic trawling and publishing software. Such theories may explain the detentions of the 10 technology staff. After the letter was deleted, the Wujie website was inaccessible for a while, but is now up and running again. The staff member told us that the remaining journalists have stopped writing new articles for the site, although it is republishing material from Xinhua and the People's Daily. Wujie is jointly owned by the SEEC Media Group (which runs the magazine Caijing), e-commerce giant Alibaba and the government of China's Xinjiang region. Despite doubts over the letter's authenticity, it has attracted wide attention from the foreign media although, as expected, no coverage within China. Some observers have noted that it comes alongside other outspoken criticisms of President Xi's policies towards the media. Property tycoon Ren Zhiqiang, who has a huge social media following, lambasted President Xi's media tour, suggesting that he was allowing the Party's needs to trump those of the people. 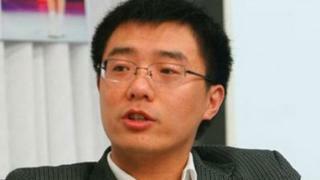 His Weibo account was soon deleted and he was attacked in the party-controlled media for "generating a vile influence". Zhang Qianfan, a professor of law from Peking University sees in all this some troubling echoes from another era. "There are constant efforts to roll back time, to use some of the tactics Mao used in the Cultural Revolution against intellectuals or against his political rivals," he says. But, he suggests, today more people have the means to fight back against those forces of repression. "With the development of the internet," he tells me, "it becomes much harder to force people to shut their mouth." For another recent and widely reported example of defiance, we can look to the relatively liberal magazine, Caixin. Amid the pomp and ceremony of China's annual parliamentary gathering earlier this month, it openly challenged the government's decision to remove an article from the magazine's website, in a comment illustrated by a picture of a mouth gagged with masking tape. The tug of war between China's old Maoist politics and those who favour moving towards more liberal reforms has long gone on, more often shielded from view, but sometimes in public. But an open call for a president's resignation would be highly unusual in anybody's book. The Chinese authorities will certainly be doing all they can to find out the truth behind the letter, and more detentions may follow. The outside world, though, may never learn the truth. Whether the letter is genuine or not, what we can say is that even as Xi Jinping tightens control, the voices of opposition are finding a way to be heard.